This is a subject so important, so crucial, it requires its very own post. But I also have a few other bits of news, which I will also place here. Should chapters only be half as long, and released twice as often? Follow this link to the poll! This thought hit me like Thor’s hammer the other day. With this, I should be able to easily maintain writing one chapter a week or more, you will not have to wait as long for the next chapter, and it will look better as the number of total chapters rise faster. Of course, content will not be changing; I will only be splitting a standard chapter into two. I assume I haven’t considered this much as most of the other original English litRPG stories which I consider to be next to mine/rivals are all this length. But I have the feeling, that sometimes more is not better. So follow the above link to the poll(strawpoll), and let me know what you would prefer. My other news is firstly, I have finally decided to give something back to my Patreon followers. I have recently learned I can make posts on Patreon the same as I would here. I am using that handy tool to release my chapter plans. Many of you will be confused by what I mean by ‘Chapter Plans’. End Online is planned one chapter at a time. Once the chapter is planned, it is then written and edited before the next chapter’s plans are even started. This is because nearly always, what I plan and what I write are different. Sometimes only by a small amount; sometimes greatly different. 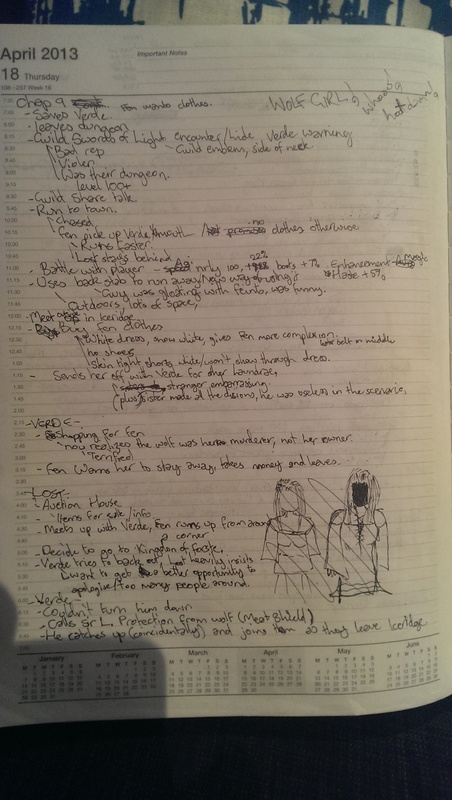 Once I release a chapter here, I will then make a post on Patreon with an image of my “scribbled” plans, and a few paragraphs on what I had planned and how it changed. Probably not why, but just my trying to show the thought process as to why it changed. I will release the first three or four free for all. Then afterwards I will release them only so the people who donate $1 a month or more can see them. This is quite a big step for me as well, I often include terrible dad jokes, and sometimes even terrible artwork (This stuff was originally never meant to be released!). Considering this is to give back to all the people who support me, I will attempt to put in a few more terrible artworks with the chapter releases (My hope is for 1 with each one). Yay… I got the pleasure to be the first!! First I wanna say thanks for all the hard work you give. End Online is really become my favorite. I think your Chapter length which is Longer than other novel is your GOOD POINT. please don’t make it half. Even though it would make us read more sooner, I don’t think it would be better. One big COOKIES is better than 2 Smaller one. the Longer the chapter the more time we could enjoy reading End Online. The standard chapter length is 8000 words, but it often goes over that quite often. You can do a word count on a standard chapter of your favourite web novel to compare. I wouldn’t be able to definitely promise weekly releases, as that depends on the editors as well, but I know I can write one chapter at half length in about 5 days. I think more smaller chapters is better. I do not mind waiting however long it takes you to write a chapter; some authors write an entire (boring generic) book every month, and other authors take several years for each book. Really it matters far more that the STORY is enjoyed by the readers than the amount of time it takes to write it. I would prefer to wait four times longer for a story from one of the authors I read than have them write a quick story that is full of flaws. However with the above in mind, now I will describe why shorter chapters would be better for the End Online story. It is simply about ART. For someone who is creative; some ideas are GOOD, but they are not worth describing in a long amount of detail. For example; a comedian can have SOME jokes that are a grand total of two sentences….and the joke is DONE, and the joke if FUNNY. If that joke is complete and funny with two sentences; it would likely be LESS funny and possibly even a bit boring if a short joke were stretched out into three pages of ‘droning’ and the final punchline. And there is humor that takes one chapter or half hour to explain; sometimes that is PERFECTION of humor because that is how long it takes to introduce the aspects of the humor, then the punchline. Okay, so for End Online. You are creative, and I am definitely enjoying your End Online story. But since you are creative; you likely have dozens of MINOR ideas that you consider adding to your End Online story, but then choose not to because any specific MINOR good idea is to you NOT enough to devote an entire full length chapter to. But if you start doing shorter chapters? Well SOME chapters should still be long, but if you also do short chapters…then you can include the minor ideas you have thought of that you did not think worth doing an entire chapter about. Also a minor comment about Lost; not about this survey today. Lost KNEW from reading about the Game Rules (his version of Wikepedia or other gamer discussion on his fictional Earth) Lost knew from that, that Maces, hammers, or other blunt weapons could STUN on a critical hit. You are completely correct there. There are an endless amount of authors out there, and have different writing speeds and quality of writing. The most important thing is definitely the story to be enjoyable. As for shorter chapters including more ideas, they won’t. There isn’t a great deal of smaller ideas, the only difference is from the original script to what I actually write. I sit down and map out the chapter, but when I write it I often go “Actually, this is better,” or “That shouldn’t happen”. The other ideas are mainly things that I want to put in future chapters. Two shorter chapters will be exactly the same as one singular, long one. I will only find a mid way point where I seperate the two chapters. I do however like the idea of a few shorter chapters, but that is virtually the same thing as when I split the chapter up into multiple POVs. I quite appreciate the thoughts on humour, it gives me a penny for thought! Well, it won’t change anything, but it may improve any future humour. I can’t tell you any spoilers ‘^.^ but I can say we will see more of Mikhail (Idea Imagine Employee) in the next volume. still 10 is better than 5 + 5. Apparently so. It appears to almost be unanimous! Hey D, do you have an ETA on book 4 release yet? I have been denying myself the chapter by chapter and am desperate for the release date. At the moment I am expecting book 4 to be ready in seven days, but I have been wrong before! There is no need for fixed chapter lengths a chapter should be as long or short as needed to best suit the story and not an arbitrary length. Well, it appears the No’s are ahead 2 to 1. I think shorter chapters would be fine, but that’s just me! Regarding your poll, IMO, you just need to have a schedule or calendar to inform us the date you will release a chapter. I read your novel per volume anyways so the poll is basically irrelevant for me. I also can’t decide how long editing will take, that is entirely up to the editors.